It looks like Darksiders Warmastered Edition is heading to Nintendo Switch, although it has yet to be officially announced. THQ Nordic uploaded a trailer for the remaster on their Media press page, but it has since been taken down and replaced by an amusing gif. The trailer was spotted and reuploaded by Vooks, which we've included below. The trailer does not give any details about release information, pricing, or date, so we'll have to wait for an official announcement to learn more. Update (January 31): THQ Nordic has confirmed Darksiders Warmastered Edition for Nintendo Switch. It will release on April 2nd £25.99/€29.99/$ 29.99, both digitally and in retail stores. 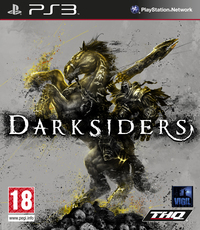 Darksiders Warmastered Edition, a remaster of the 2010 Zelda-like, released on PlayStation 4 and Xbox One in 2016, and on Wii U in 2017.